Happy Monday! Today is a great day to start the week because it’s Secret Recipe Club day! This month I was assigned The Wimpy Vegetarian, a blog by Susan who is an almost (or “wimpy”) vegetarian. Susan eats mostly vegetarian and treats meat as a side dish or accent to a meal rather than the main event. I really like this philosophy and lately we have been trying to do the same (have you noticed how many meatless meals I’ve been making recently? Many more than usual! ), so I was really excited to get Susan’s blog this month. It’s actually kind of funny that Susan’s blog was my assignment this month, because just last month Susan was assigned to my blog! She made my Jalapeno Cornbread Poppers! Susan’s blog has a ton of great vegetarian and almost-vegetarian recipes and she’s even working on a cookbook to showcase more of her ideas. Some of my favorite recipes I perused included Shrimp and Corn Griddle Cakes with Roasted Red Pepper Butter and Sweet Potato Biscuits with Honey and Coconut Oil (sooo up my alley lately). When we were in San Francisco recently, we went to a Moroccan restaurant one night. We had a ton of food, and everything was so good. I hadn’t had Moroccan food since I lived in Paris 10 years ago, but it was just as good as I remembered it. They use lots of unique spice combos and are big on the sweet & savory combo (my favorite). 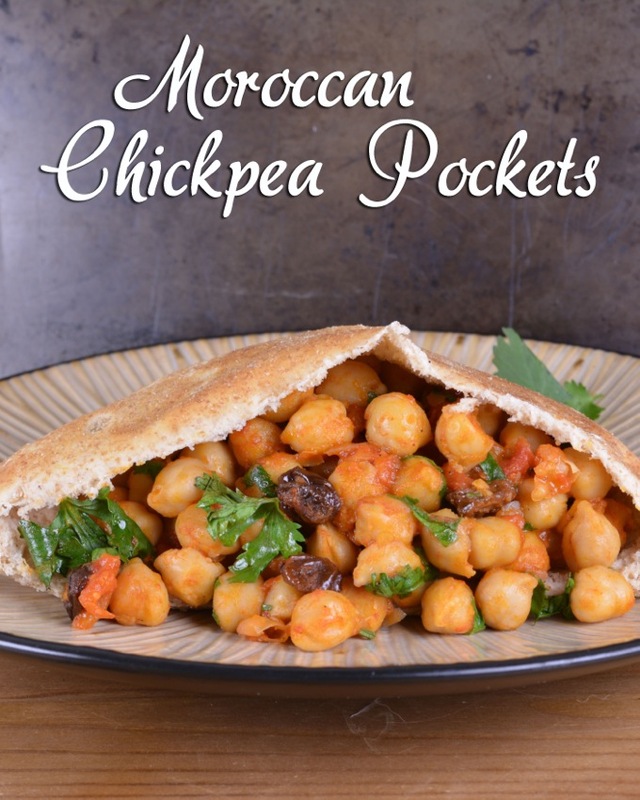 When I saw Moroccan Chickpea Pockets on Susan’s blog shortly after that wonderful meal… I knew that’s what I had to try! Chickpeas are a great vegetarian source of protein and iron, and one that I use pretty frequently. The Moroccan spices on warm chickpeas sounded amazing. Heat the olive oil in a large saute pan over medium heat. Add the salt, spices and garlic and cook 5 minutes until garlic is fragrant. Add the orange juice and raisins and simmer 2 minutes. Stir in the tomatoes and cook until sauce thickens, about 5 to 7 minutes. Fill warmed pita pockets with the chickpea mixture and serve. The chickpea pockets were great. They were super flavorful and unique. Susan tries to give her food enough flavor that her hubby doesn’t miss the meat, and this recipe definitely worked! Nick loved this meal and couldn’t stop talking about how delicious it was. A definite winner! Thanks, Susan, for a great SRC meal! Mmm, I would love to try those pita pockets. They sound like a fantastic vegetarian dish. This dish is definitely now on my must-try list. I love Moroccan food, and I’m always looking for new ways to make a meal out of chickpeas. I especially love the sweet-savoury thing going on here with the inclusion of the orange and raisins – I’m thinking dates would be a good alternative too. I also know the “meat-lover” in my house would love this too, so I’m pretty sure this will be making the menu plan very soon. I’ve been on a chickpea kick lately, using it a lot. 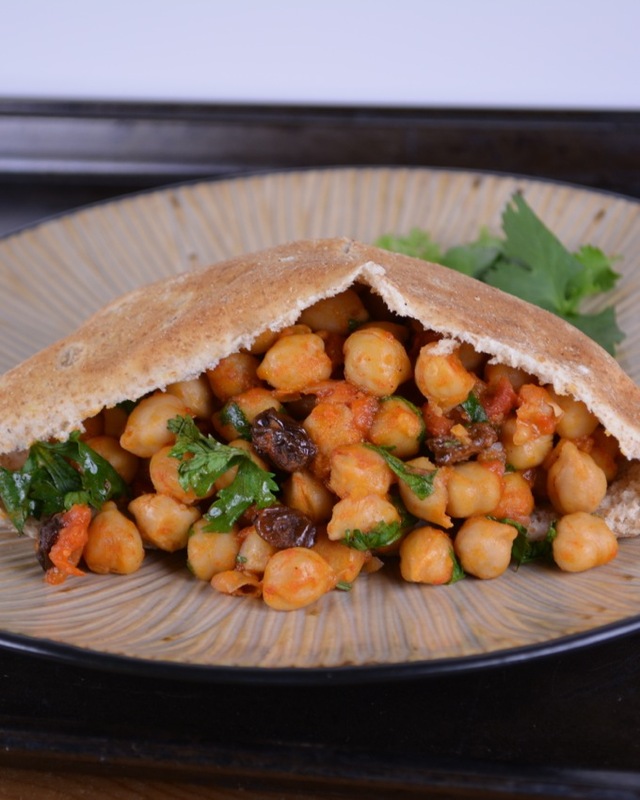 The idea of chickpeas to fill pita pockets is brilliant! A nice, filling meal, but not over the top… loved it! I have never tried Moroccan food but I think I will soon. Great choice this month. Yum, I love raisins in savory dishes. Great pick! You convinced me! It’s on the stove right this instant! Great SRC pick! Yay!! It’s also a great meal because I usually have most of the ingredients on hand! I’m so glad you liked this dish, Jess!! It’s one of our favorites too 🙂 Yay!!! Just curious, did you go to Aziza’s?? It’s a fantastic Moroccan restaurant in the city that I just love. It’s so funny that I had your blog just last month. Those fabulous little jalapeño cornbread poppers are still getting traffic!! What a winner recipe it is! Nope, it was actually Marrakesh. But we are in SF fairly often so we will definitely have to try Aziza’s sometime!! I just bought a Moroccan cookbook because I’ve heard how great the food is! This sounds amazing. Great photo too! I would be all over this recipe for dinner. And I bet it would make great leftovers too. Happy Reveal Day! I had Susan’s blog previously and she has such great recipes. This looks absolutely delicious and perfect for vegetarian guests. Great SRC pick! I LOVE chickpeas and so this is a GREAT recipe for me, plus it’s a sandwich too, which I also love Jess! what a healthy and great looking recipe! I am in love with how versatile chick peas are, these chick pea pockets are calling my name. Pinning so I can try them myself! Wow, these look amazing! I am addicted to chickpeas, I could eat them everyday, so I am totally loving this recipe! Definitely have to try this one out! Love pita pockets! Such a wonderful looking vegetarian version. Great pick! I just made some chick pea tacos the other night and they were so good, they really are a perfect substitute for meat, although I’m not sure my husband would agree with that! I’ve never cooked Moroccan food before, but the seasonings sound amazing! What a fun idea for a meatless meal! I really love how simply this comes together! It also looks like something great to take to lunch! 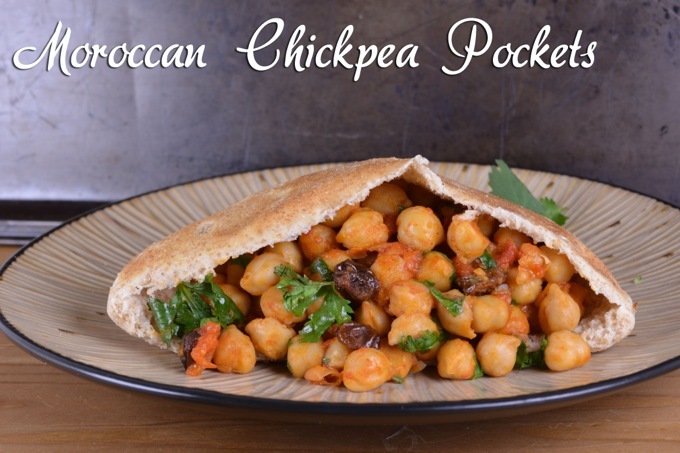 I love the flavors of these chickpea pockets! Such a great vegetarian meal! Stopping by from the Bloom Designs Link Party.. Yum! Chickpeas are pretty much one of my all time favorite foods. Love this recipe!